Tag lines are an extension of your company’s name and provide more information about what your company does. It is important to spend time coming up with a good tagline that fits your business and memorable. Tag lines are particularly crucial if your company’s name does not make it obvious what you do. What is the purpose of this tag line? Are you trying to sell a particular product, or is this more of a PR message about your company? What benefits will the people listening to your tag line get? You want something that is going to stand out to people, and make them feel like they know what they are getting by choosing your company. Add adjectives. Come up with adjectives that you think will help combine your first 2 steps. Put it all together! You have all the pieces of the puzzle, now you just have to mix them around and try different combinations, till you find one that works for you. Don’t try and be clever. As fun as it is to try and come up with something witty and charming, it often doesn’t send the right message. Plus, you might end up with a bunch of confused people who don’t get the cleverness, and then you spend more time explaining your tagline than selling yourself or your product. There are many ways to stick out of the crowd. Instead of making a broad generalized statement about your company, have a couple more tailored product-specific taglines. This way, depending on the people, you can pick one that matches the conversation and grab the attention of your listeners. Something short and sweet usually does the trick. I suggest nothing more than 2 short sentences long, and I strongly encourage keeping it down to one. Try and consider your tag line sort of like poetry. Pick words that go well together, and roll off your tongue easily. Also, consider what word(s) to emphasize. Changing where you normally would put an emphasis or adding extra emphasis on a word, can change an ordinary tag-line into a memorable one. When creating your tagline, you want it to work for you in as many ways as possible. Making sure you have the most important keywords that are also optimized on your website, will help give you an extra boost in the SEO of your website. Need Some feedback? Post your work-in-progress taglines below. Don’t have time and want someone else to do it? Thats what we are here for! Contact IWD today for your branding needs. We all know that when people go onto websites they are scanning the page to find the information they are looking for. Unlike books or magazines people are more likely to skim instead of read. Many studies have been done to learn how we read websites. This valuable information helps designers and businesses alike create websites with the most essential information in areas that people look at the most. Here are a few examples of websites with eye tracking represented by heat maps. The color on the map translates to the number of people in the study who stopped in those spots. So the blue spots represent very little eye contact, where as the red spots mean that 100% of the people in the study stared at that spot. As you can see very little people looked in middle or bottom right of the webpage. On average people will spend 5 seconds on a webpage to look for information. If they can’t find it they will move on to another webpage or website. Now that you can see how people look at website, look at your own website. Is the most important information in the top left corner of your website? Is the most important content in the first 2 paragraphs of your webpage? Along with placement your content is equally important. Having a skim-friendly content will make it easier for people to find what they are looking for and closer to spending money on your products or services. When writing content for a website, make sure that you use bulleted lists and short paragraphs. Identify the paragraphs with bold titles and make sure not to have too much content per page. People don’t like to scroll down a lot, so try not to overwhelm them with too much text. If you need help analyzing your website to see what you can do to make it more user friendly, contact Infinite Web Designs today. This Valentine’s Day we want to share the love with all of our friends. In light of the holiday we would like to start a comments chain. Here is how it works: If you post a comment on one of our blogs posts or on IWD’s Facebook Page, we will return the love by posting a comment on your blog or Facebook page. We all know that getting the conversation started is the hardest task; so we want to help! Maintaining a conversation with people online is very important for your business. It creates a space for your current and potential clients to give you feedback about your products and allows you the chance to educate people about your industry. Showing how much you care about your customers may convince others to buy your products or services. As an added bonus, these conversations can help you with your search engine optimization (SEO). Search engines like to see website blogs that are active and adding new content. The more active it is, the better it is for your SEO. You can also harness the power of Facebook and get more people to go to your website. The additional traffic to your site will help your SEO and hopefully help you land more business. Join us in our “Spreading the Love” campaign and start the conversation today! A QR Code is basically a barcode that holds a small amount of data. This information could be a website URL, contact information, a map and directions to an event, or a coupon for your favorite store .QR codes are universal barcodes that can be read on any smart phone as long as you have a QR Code scanner app. You have probably noticed them around, and you should expect to see them more and more as their popularity grows here in the United Sates. They are the latest craze in Japan, and making there way to the US. 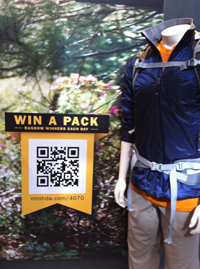 The QR codes are great because they are free to generate and free to scan. 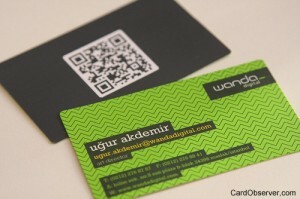 One creative way people are using QR codes is placing it on the back of their business card allowing people to scan and automtically put the information into their phones. 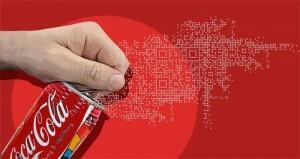 QR codes can also be used in advertisements and offer a special discount if the scan it. As you can see there are countless ways to use a QR code, below are just a few fun ones I found online. Download an application onto your phone to scan the QR codes. Browse for “QR Code scanners” in your app directory on your phone and download one. Then try it out by scanning the QR code above to see if it works. New marketing tools are constantly evolving on the Internet. While having options is a great thing, the steady stream of new marketing choices can make it overwhelming to know which is the best fit for your business. If your budget for 2011 has been finalized, hopefully you included creating or building upon your Internet effectiveness. If your budget is still in the works, remember that planning a budget is a great opportunity to analyze your marketing tactics. See what has been working (and not working) and incorporate what you’ve learned and the ideas which excite you and your team for the upcoming year. With the shift of marketing focus towards the Internet, it’s important your budget reflect where your time, energy and money will be going. Internet marketing is made up of different components including social media, search engine optimization, and website re-design. According to a marketing report distributed by Hubspot, over the past year, 88% of marketers have maintained or increased their Internet marketing budget. Your website is the most important element of your Internet marketing plan, so be sure to plan for the resources to do it right. Businesses are increasingly aware of the importance of SEO in building and maintaining an advantage over the competition. You may have a great website, but if search engines cannot find it, you will not have an effective online presence. It is estimated 85% of individuals use search engines to find services and products, and of this group, very few will click past the first few pages of search engine results. SEO helps ensure a website will get more traffic by being listed high up in the results. Unlike most marketing strategies, SEO works 24/7 to give you a high return on your investment. Be sure to use a web professional to assist you in planning your budget as there are a number of SEO options out there to maximize your web presence. Your website is your best online advertising, so make it count by finding the right SEO strategy for your business. Don’t be fooled by the use of the word “social” or the fact some social media sites started out as a hub of activity for teens and tweens. Social media is becoming an an increasingly important marketing tool across every industry and age-group so be sure it’s in the conversation when planning your marketing budget. Social media is not a fad, but a shift in how people communicate. According to Facebook, they have over 500 million users who spend over 700 billion minutes per month browsing personal and business pages. Not building social media into your marketing plan means ignoring a huge online population who may want the services or products you offer, so their dollars will be going into the pockets of your competitors who have embraced this new form of connecting. As an added bonus, the more you participate in social media, the more you are helping the optimization ie: the “findability” of your website. With so many social media sites online, there are sure to be some excellent fits for your business. No matter how much you love your website, there is always something you wish was better. A website re-design may help boost traffic to your site, and more traffic means more potential sales. More traffic also has the benefit of improving the optimization of your website (SEO). Just as you go for an annual physical with your doctor, plan for a website check up too. People expect websites to be contemporary with up-to-date information and features so it’s important to apply resources that ensure individuals browsing your site don’t navigate away disappointed. Be sure that once a person gets to your website or social media venue they can find what they need quickly and easily. When developing your marketing budget, consult with a web professional to help brainstorm ideas on the future direction of your website functionality and design. Most people have heard about or been directly effected by the power of Internet marketing. It’s the job of businesses to determine the needs of their company and invest in the future. If you find the markets strategies of yesterday are not as effective as they had been, or believe your competition is passing you by, it’s time to try something new. In this day and age, some of the first new things to try are re-vamping your website, starting up on social media, and employing search engine optimization techniques to drive people to your website. Include a web professional while you create your online strategy to make sure your company gets the results it deserves. Tell us what you think! Leave a comment below about what you think is important to have in your 2011 marketing plan/budget. Still have questions from the recent seminars? Post your questions here and get answers from other local businesses and industry professionals. We encourage you all to comment on other posted questions as well. The more participation there is the more we all learn. No one can deny that social media is here to stay. It has engulfed our younger generations and has offered advertising and marketing possibilities to small and big businesses alike. A friend sent me this video created by John Lai that was posted on YouTube last year. I think it is a great example of exactly how much communication has changed and how fast it is changing. As displayed in this video, if you are not playing a role in social media you are missing a huge market of people. More and more people depend on Google searches, Facebook commentary, and blog advice to make their consumer decisions. Becoming involved in social media is not too expensive, it just takes time. I hope this video proves that taking the time is worth the value to your business. Infinite Web Designs can help you come up with a social media strategy, set up your accounts, and even manage them. Contact us today to start or improve your social media business strategy and take advantage of the endless possibilities waiting for you. This sentiment seemed to be a common topic of discussion at our first “Infinite Mind Share” event a few weeks ago. As a small business owner, I was just as guilty of letting my own marketing tasks fall to the bottom of the “to-do” list – until I began to reap the new business rewards of putting a simple marketing plan into play. Over the past few months, I have re-designed IWD’s website which utilizes the latest in SEO technologies and social media. I am the co-organizer of Fairfield County’s “Infinite Mind Share” – a networking “Tweetup” group for everyone interested in all things social media. I am updating this blog on a regular basis and using Facebook and Twitter to touch base with my clients – and prospective clients – in a casual, yet informative, way. As I have learned first-hand, making time for marketing makes for new business. Contact us today to learn how IWD can help you make time for marketing, and be sure to make time to talk with us at our next “Infinite Mind Share” event – March 30th, 6pm-8pm at the smart center in Fairfield.